The Patriots' Bill Belichick is light years ahead of the next best coach in the NFL - whoever that may be. You saw it front and center in the waning seconds of Super Bowl XLIX. A coach has his counterpart, Bill Belichick, and his New England Patriots on the ropes, only to let them off the hook. So often, those failures are self-inflicted wounds, a result of outthinking oneself rather than your counterpart. Belichick is undoubtedly the best coach of his generation, and arguably the best of all time at his craft. But it doesn’t mean that he hasn’t had help along the way. The Patriots have won more close games than anyone over the past decade-and-a-half, and many times, it has been Belichick’s genius combined with his opposition’s meltdown. This game does not get enough credit in the epitomization of Miami’s constant December swooning and New England’s December (and January) magic. Ironically, this win was not enough to help the Patriots get to the playoffs, as 2002 still stands as the lone season in which Tom Brady did not reach the postseason. Miami entered this game 9-6, with New England at 8-7. A Dolphins win would have clinched the AFC East, but their loss ultimately opened the door for the New York Jets to win it. 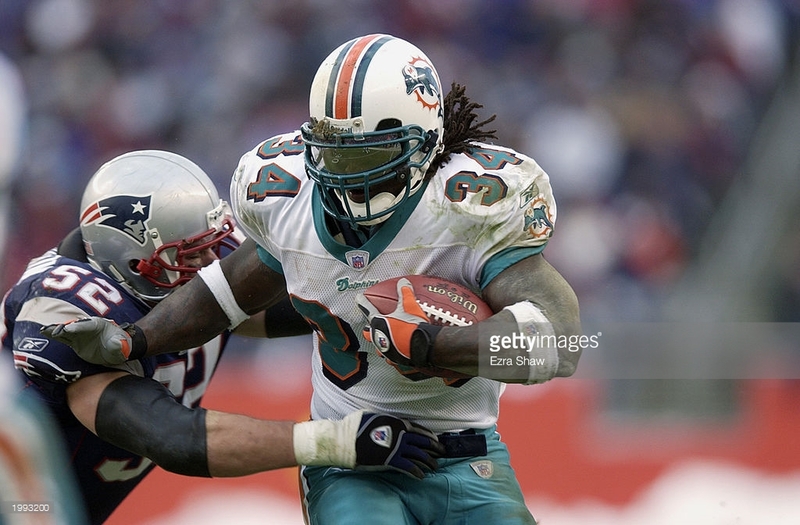 In a season in which New England could not stop the run, the Dolphins started out fast, with Ricky Williams shredding the Pats’ defense for 120 yards on 14 carries in the first half. Miami led 21-10 at halftime, and 24-13 with five minutes to play after converting a Tom Brady interception into a field goal. Rather than put the game away, the Dolphins began to implode. Brady led a touchdown drive aided by a pass interference call against Miami cornerback Jamar Fletcher, with a subsequent two-point conversion making the score 24-21. But the true meltdown was in the sequence that followed. Expecting an onside kick, the Dolphins brought almost the entire return team to within 10 yards of the kick, leaving Travis Minor on an island at the goal line. Adam Vinatieri kicked it deep, and a lucky bounce along the goal line helped the coverage team pin Minor inside his own 5-yard line with 2:42 to play. New England had all of its timeouts at this point. Dave Wannstedt, who ultimately lasted just another season-and-a-half in Miami, could have pounded Williams to try and pick up a first down and salt the game away. Figuring the Patriots would make adjustments as they often do (Williams was held to just 65 yards after halftime), Wannstedt called three consecutive passing plays. The first two were incomplete, and quarterback Jay Fielder scrambled short of a first down on the third play. New England was able to preserve two of its three timeouts. Punter Mark Royals then shanked his kick, giving the Patriots possession at Miami’s 34. Even though the Dolphins defense did not permit a first down, New England picked up nine yards, and Vinatieri tied the score with a 43-yard field goal to send the game into overtime. From there, the writing was on the wall. Sure enough, New England won the toss, and Miami never touched the football. Brady drove the Patriots 43 yards in seven plays, and Vinatieri drove in the final dagger with a 35-yard chip shot. The comeback win knocked Miami out of the playoffs, and temporarily kept hope alive for New England. The Jets crushed the Packers, 42-17, in a late-afternoon game to knock the Patriots out, but still, this game showcased the major discrepancy between Belichick and most of his foes — particularly Wannstedt. Ricky Williams had his way with the Patriots defense in the 2002 finale, but head coach Dave Wannstedt failed to call his number in the game’s critical moments, leading to a Patriots comeback win in overtime. The Patriots got to 18-0 with this win against the banged up, undermanned San Diego Chargers. They also got a major assist late from Bolts head coach Norv Turner. San Diego hung as tough as it could in this one, despite the fact that its quarterback, Philip Rivers, was playing on a torn ACL, and its All-Pro tight end, Antonio Gates, had a severe case of turf toe. Factor in that superstar running back LaDainian was lost for the day after just two plays, and the Chargers were in deep you-know-what. Defensively, the Chargers made plays, picking off Brady three times and holding New England’s record-setting offense to just 21 points. The problem was, the Chargers could not capitalize on any of their scoring chances, settling for just four field goals. Despite their red-zone shortcomings, the Bolts were down by just nine, 21-12, in the fourth quarter. Facing a critical fourth-down play, Turner had a decision to make. It was simple: go for it. Down by nine and having already burned one of their three timeouts on the opening drive of the second half, the Chargers were in no-man’s land at the Pats’ 36 on 4th-and-10. Inexplicably, Turner opted to punt, and sure enough, the Chargers would never touch the ball again. Brady and Co. held the ball for the final 9:13, converting four third downs on a 14-play drive to seal the victory and a trip to Super Bowl XLII. This one was set up nicely for Baltimore. As one of the few teams that has historically stood up to New England in big moments, the Ravens had not one, but two 14-point leads on the road in this showdown with the top-seeded Patriots. One of the prime examples of John Harbaugh being outcoached by Belichick was evident within the final statistics. Joe Flacco threw four touchdown passes and was not sacked, and the Ravens outrushed the Pats 136-14. New England averaged 1.1 yards per carry, and Brady was sacked twice and picked once. After starting slow, the Patriots offense picked things up in the second half. The Ravens not only could not contain tight end Rob Gronkowski and wide receiver Julian Edelman, they also could not figure out New England’s strategy. The Patriots employed a four-man offensive line for several plays, not only confusing the Ravens, but enraging Harbaugh so much that he drew a 15-yard penalty for running onto the field to berate the officials despite the plays being legal. The Ravens still had a chance to drive for a win at the end, but the play-calling came back to bite them. Flacco calmly led the Ravens 53 yards in eight plays to the New England 36, and they still had a timeout and 1:39 to play. Offensive coordinator Gary Kubiak made a bizarre call to have Flacco loft a bomb to Torrey Smith down the sideline, despite the Patriots having safety Duron Harmon helping over the top. Harmon picked off the overthrow, icing the win for the Patriots. Before this issue resurfaced in this year’s AFC divisional playoffs, Andy Reid’s horrendous clock-management skills reared their ugly head on an even bigger stage in February 2005. New England found itself in a dogfight with the Eagles, tied after three quarters. The Eagles’ defense forced a quick three-and-out after a potentially backbreaking interception by Donovan McNabb, and trailed by 10 with 5:40 to play at their own 21-yard line. Rather than go no-huddle and play with a sense of urgency, the Eagles methodically moved down the field. There was speculation after the game that McNabb was throwing up in the huddle, something he still disputes to this day. Whatever the reason, McNabb and the offense was incredibly deliberate. The Eagles eventually scored on the first play after the two-minute warning, as Greg Lewis caught a 30-yard touchdown pass, but they did not use either of their two remaining timeouts on the entire drive. With 1:48 to play, the Eagles attempted an onside kick, which New England recovered. Philadelphia did force another three-and-out, but only got the ball back with 46 seconds to play at its own 4-yard line. McNabb was intercepted three plays later, sealing the Patriots’ third Super Bowl win in four years. Perhaps Reid’s logic that day was the same as it was two weeks ago, when he admitted after his Kansas City Chiefs came up short that his plan was to hold the ball as long as possible, score, and get the onside kick. Obviously, that strategy failed, and Reid was on the short end against Belichick once again. 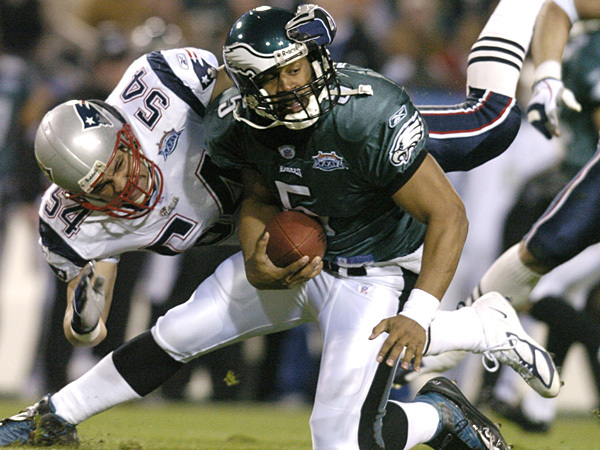 Tedy Bruschi brings down Donovan McNabb in Super Bowl XXXIX. Ultimately, Andy Reid’s poor clock management brought down the Eagles’ chances of a comeback. This one doesn’t even feel like it needs an explanation. But of course, I’ll give you one anyway. The Patriots had rallied from 10 points down to take a four-point lead over the Seahawks late in the fourth quarter, but Seattle was in serious business for a second straight Lombradi trophy following a circus catch by Jermaine Kearse that made it 1st-and-goal from the 5. With under a minute to play, all-world running back Marshawn Lynch nearly broke free for a touchdown, but was tripped up by Dont’a Hightower at the 1-yard line. The clock was running down to a half-minute, prompting many to assume Belichick would use one of his two remaining timeouts in case the Seahawks scored. Many people still claim Belichick got lucky, but somehow I don’t buy that. Seattle had one timeout remaining, so with such little time remaining, Belichick knew that Seattle would likely have to pass on two of its final three plays. He also saw the personnel the Seattle had on the field, and was content with his defensive setup. Rather than do the logical, sane thing and pound Lynch from the 1 where he’s almost automatic, Pete Carroll, Belichick’s predecessor in New England, tried to get too clever. Not only did Seattle call a passing play, but a one that went right into the teeth of the Patriots defense. Russell Wilson made a poor throw to Ricardo Lockette, and unheralded, underrated rookie cornerback Malcolm Butler jumped in front to seal one of the most dramatic wins in Super Bowl history. 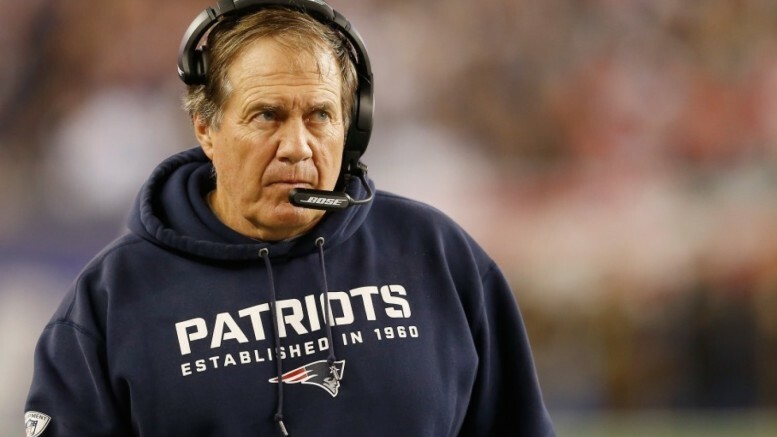 Be the first to comment on "5 Times When Coaches Outcoached Themselves Against Bill Belichick and the Patriots"